WACO, Texas (AP) — Kalani Brown walked in carrying the national championship trophy, with Chloe Jackson right by her side. 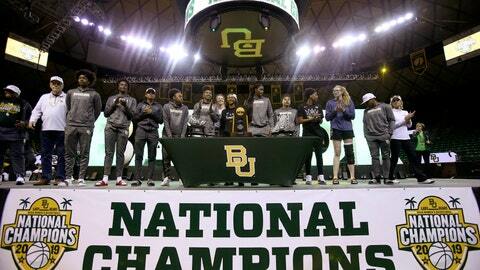 Baylor’s two departing players, one who got to Baylor as a highly touted freshman and the other a graduate transfer who wanted to win a title, led the Lady Bears into their home arena for an on-campus celebration Monday. “I’m overcome with happiness,” said Brown, the 6-foot-7 senior center who was a three-time unanimous All-Big 12 pick with the Lady Bears. “It’s a blessing, it’s a feeling you can’t put into words,” said Jackson, the transfer from LSU who had to make the conversion to primary point guard. Coach Kim Mulkey and the Lady Bears, who beat Notre Dame 82-81 on Sunday night, returned home from Florida and went directly from the airport to the Ferrell Center to celebrate their third national title with their fans. “Tired. A good tired,” said Mulkey, the AP coach of the year and coach for all three of Baylor’s national championships during her 19 seasons. Lauren Cox, the 6-4 junior post who suffered a left knee injury late in the third quarter against Notre Dame, still had a huge brace on her leg but walked without the aid of crutches. After the celebration, Cox had an MRI and an examination that determined that she suffered an MCL sprain with bone bruising and will not need surgery. Baylor led by 12 points when Cox got hurt against Notre Dame, which tied the game before the Lady Bears went ahead to stay on a driving layup by Jackson in the closing seconds. Jackson also had the tiebreaking basket in their semifinal win over Oregon . Cox, after being taken off the court in a wheelchair, was back on the bench in the fourth quarter with her teammates. “I had to hold myself back from jumping up on some of the plays,” Cox told the fans. “I’m just thankful that LC gave us a cushion before she went down,” sophomore DiDi Richards said. Richards, one of three starters who will be back next season, said she can’t wait to see the 2019 national championship banner hanging from the rafters near the 2005 and 2012 title banners. There is also a banner marking Baylor’s 2010 Final Four appearance, along with all of their Big 12 championship banners. The national championship trophy was placed on a table on the stage between Baylor’s two Big 12 trophies from this season, one for their 10th consecutive regular-season title and the other for another conference tournament title. The scoreboards in the arena read 82-81 for the final score against the Fighting Irish, the same team the Lady Bears beat for the national title seven years earlier. Brown only had a few hours back in Waco before she was flying to New York on Monday night in advance of this week’s WNBA draft.